This interview is the latest in an Accepted.com blog series featuring interviews with current MBA students, offering readers a behind-the-scenes look at top MBA programs. And now for a chat with Tim Hager, a student at Wharton. Tim: I am from a small town outside of Philadelphia, PA called Ivyland. I went to Georgetown University as an undergrad (Class of 2009) where I studied Finance and Management, and played on the golf team. After undergrad, I competed as a professional golfer for 2 years, and then worked in finance for the following 3 years. My favorite ice cream is, hands down, Ben & Jerry’s Chocolate Chip Brownie. Accepted: Where and what year are you in business school? Tim: I am in the MBA class of 2015 at The Wharton School (UPenn). Accepted: In what ways would you say that you’re a good fit with Wharton? Tim: The great thing about Wharton is that there is no “normal.” Our class represents such a diverse group of backgrounds, professions, and cultures; so everyone’s fit with Wharton is what they make it! For me, my fit is with the day to day culture: I go to school with over 800 incredibly smart and accomplished people and we all take the curriculum, studying, and recruiting very seriously. But, equally important is that we are also good about compartmentalizing the stress of recruiting and academics and at not taking ourselves too seriously at times. We make sure we capitalize on the other benefit that b-school offers: growing your social network, traveling the world, building friendships, and just plain old having fun with your classmates. Tim: Have it not be so darn expensive! But no, in all seriousness, Wharton is an incredible place and the friendships, networks, learning, job prospects, and just genuine fun that it provides us is more than I ever imagined. Wharton is a remarkable place of opportunity, and I wouldn’t change that at all. Accepted: Can you tell us about your internship at CommonBond? In what ways did Wharton help you secure that internship? What’s the internship recruiting process like at Wharton? Tim: The internship recruiting process at Wharton means different things for different people. It really starts in early fall for first year students looking to get into mature industries like Investment Banking, Investment Management, and Consulting. In these industries, students are networking and preparing for interviews really starting a few months after they arrive at school in the fall. Recruiting for business roles (Management, Marketing, Operations, Sales, etc) at many of the Corporate, F100 Brands occurs a bit later (Jan-March). Finally, recruiting for early stage companies and startups typically happens last, but can range anytime from February to May. Sometimes startups will recruit on Wharton’s Campus, and other times students identify a startup they are interested in and secure the internship on their own. It really ranges. Wharton was key in allowing me to get my internship with CommonBond. CommonBond was one of the early stage firms that recruits via Wharton’s internal career website, and that was the first time I was introduced to David Klein and the rest of the awesome team at CommonBond. My internship at CommonBond has been tremendous thus far. A big reason I came here was to be a part of an innovative firm disrupting the industry in which they compete. CommonBond is doing just that. I had worked in venture (on the financing side) for three years before coming to b-school, and wanted to experience being on the operations and execution side of the equation. I have experienced just that and then some! The challenges facing any early stage firm are more than most people imagine; and when you identify an opportunity or need to get something done, it falls directly on you to do it. That is the coolest part. I’ll give you an example. Although my job role is business development here at CommonBond, I have spent time building website landing pages, running social media marketing campaigns, writing industry content, and analyzing new markets, in addition to my core BD functions. Accepted: B-school’s not cheap (as you mentioned) — do you have any tips for us on how to finance your business degree? Tim: Be smart about it. Do your research. Look, the cost of education is high, we all know it. But the cost of money to buy that education is equally high. There are a lot of places to go for loans. My advice? Look to a lender who is going to provide value above and beyond the check that they write. Look for one that tries to understand who you are, helps grow your personal and professional network for you, and supports your career goals. Commonbond.co is the lender doing it the best. Accepted: And finally, do you have additional tips you can share on how to get into a top business school like Wharton? 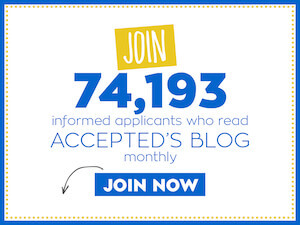 What are some things applicants can do to optimize their chances of acceptance? 1. Don’t wait until the last minute to take your GMAT. Use whatever free time you have to study NOW, and take the test. Your scores are good for 5 years, and it takes the pressure off of you the 6 months before applications are due, when you should be focusing on essays, recommendations, and your personal narrative; NOT figuring out how long it will take for a cylindrical barrel to fill up with 4 hoses in it all running at different speeds. Many of the prep courses out there are good- I used Manhattan GMAT – but 80% of the prep is still going to be on your own, outside of the prep class in order for you to really nail the GMAT. Take practice tests; I took 8! 2. Apply in round 1 or round 2….don’t wait for round 3 unless you’ve won an Olympic gold medal, walked on the moon, or are fluent in 10 different languages. 3. Be YOU in your essays, and not who you think the admissions office wants you to be. Seriously. If you think admissions directors haven’t heard every line in the book, your mistaken. Insincerity is unmistakable. And so is vanity; be proud of who you are but there’s no need to boast…I promise you, your classmates-to-be are equally as cool and accomplished. Finally, do some hard thinking about what is truly unique about you. I’m not talking about how you were the only one of your PE associates to get asked back by your PE firm for a third year (Let your boss say that in his recommendation!). You focus on what truly matters to you in life. Answer that and let it come out in your writing. 4. Apply everything in point #3 to your in-person interview as well. • What’s Right with Wharton (and How to Get In), a free webinar. Thank you Tim for sharing your stories with us!